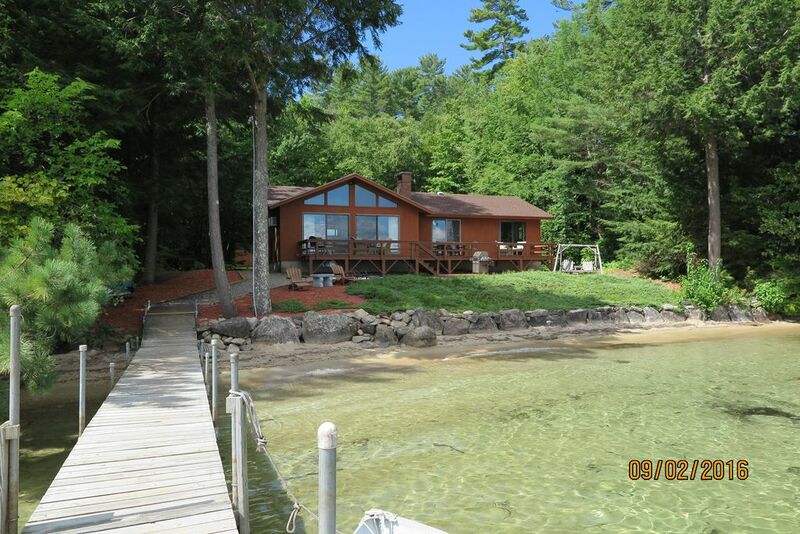 Beautiful Winnipesaukee Veasey Shore, Mountain View, Sandy beach, 50 ft dock. This home is located very close to the water's edge, with 125 feet of child safe, gently sloped, sandy beach and crystal clear water, a 50-foot private dock. The superb view from the master bedroom, kitchen and living room is one of the most exquisite combinations of lake and mountain scenery. Nicely furnished. No Pets and No Smoking please. Blankets, Pillows, Bed and Bath Linens are provided; Please bring your own Beach Towels, 2 queen beds (one in master bedroom, one in second bedroom ) twin and full size bunk beds in third bedroom, and a full size bed(in the living room). Veasey Shore Road is a dead-end street with some of the best coastline on lake Winnipesaukee. This home is situated on two acres of land, very private. In front of the house is the open expanse of the lake with Black Cat Island 1.5 miles away clear across the water. Close to two towns, 3 miles to Meredith or 3 miles to Center Harbor. 2 queen beds, bunk beds with twin on top and Full on bottom, Full size bed in living room ; air conditioning in living room; 12 ft aluminum boat, full kitchen, gas BBQ grill. Great boating with easy access to all of the lakes comunities. 3 miles to Center Harbor, where you can board the Mount Washington and tour the lake. Other nearby attractions include Castle in the Clouds, Squam Lakes Nature Preserve, 5 minutes to Center Harbor, 5 min to Merideth, 30 min to Wolfboro, 45 min to North Conway , 45 min to Lincoln and 1 hour to Mount Washington . Rent canoes, kayaks, jet skis, etc. at nearby rental shops. Hiking, golf, dining are all close by.